We’ve held dozens of sumo lectures and demonstrations at all types of schools. From elementary schools, middle schools, high schools, and universities, to numerous Japanese language and culture schools, sumo is an awesome and entertaining way to teach Japanese culture, martial arts, cuisine, ritual, and more. Some appearances have been for a single class period, while other educational programs have gone on for several days, demonstrating almost every aspect of sumo lifestyle and related Japanese culture. Our programs are available in both English and Japanese. Attendees have hands-on opportunities to try sumo, to cook sumo stew, to learn the basic exercises, and more. 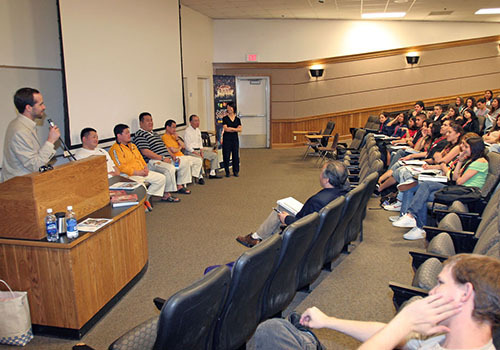 There are also plenty of opportunities for Q & A, and interaction with World Sumo Champion athletes. Yama, Pro Sumo Star and heaviest Japanese person ever, appears at Whitney High School. The entire school of 1,000+ students showed up for the assembly, as Yama shared his sumo experiences, answered questions, posed for photos, and even taught some youngsters the basics of sumo! This special session covered sumo techniques for 19 participants from 2 countries and 6 U.S. states. Many participants excelled in their next competition. 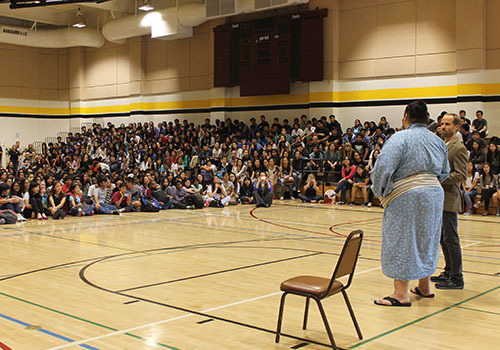 A top Japanese Sumo Team from Japan performed sumo lectures, demos, and sumo training at 10 universities and high schools throughout Southern California. Over 12,000 students watched the sumo demonstrations, and asked questions to the visitors from Japan. AKEBONO offered a historic Sumo Clinic, the first time that a pro sumo coach and “yokozuna” (Grand Champion) coached international athletes in sumo in the U.S. Legendary Musashimaru worked with us, hands-on, at this prestigious Japanese cultural event, in conjunction with the National Cherry Blossom Festival. 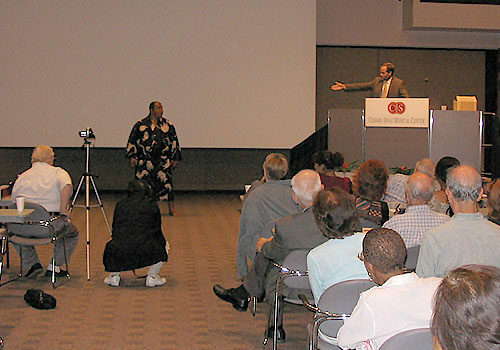 We’ve done multiple lectures for renowned medical staff at the world-famous Cedars-Sinai Hospital. Educated folks definitely love to learn more about sumo. Kids Sumo Seminars, Carson High School Sumo Lecture & Demo, Cal State Northridge University Sumo Lecture, LA Bloom Children’s Day Sumo, Cal State Northridge “Carnaval” (annual), Sumo training for medical staff in multiple nursing homes, Long Beach State, Santa Monica College, Cal State San Marcos, and UCLA, and more.